MenuBar consists of drop-down menus, and is normally located at the top edge of the window. 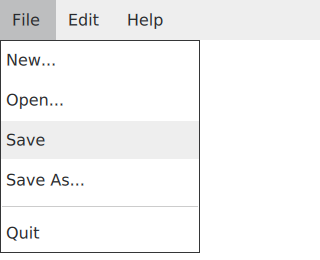 Typically, menus are statically declared as children of the menu bar, but MenuBar also provides API to add, insert, remove, and take menus dynamically. The menus in a menu bar can be accessed using menuAt(). See also Customizing MenuBar, Menu, MenuBarItem, Menu Controls, and Focus Management in Qt Quick Controls 2. This property holds the content height. It is used for calculating the total implicit height of the menu bar. Unless explicitly overridden, the content height is automatically calculated based on the maximum implicit height of the items. This property holds the content width. It is used for calculating the total implicit width of the menu bar. Unless explicitly overridden, the content width is automatically calculated based on the total implicit width of the items and the spacing of the menu bar. This property holds the component that is used to create menu bar items to present menus in the menu bar. This property holds the list of menus. The list contains all menus that have been declared in QML as children of the menu bar, and also menus that have been dynamically added or inserted using the addMenu() and insertMenu() methods, respectively. Adds menu to the end of the list of menus. Returns the menu at index, or null if it does not exist. Removes and returns the menu at index.